Hi all, This is my 200th Post. 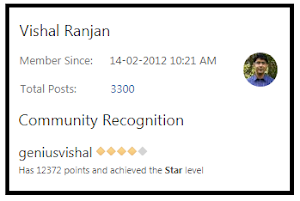 All this Journey started with a single Post in a small newbie blog @ October,2012 which has evolved into this massive asp.net Repository as of today. This site has crossed more than 0.2 Millions Pageviews from 160 Countries which itself speaks of its Popularity . I would heartily thank all the readers of this site and request you to be the part of this site in the future as well. New Ideas and Innovative thoughts are always welcomed. You can contact me Personally at my mail Id vishalranjan2k11@gmail.com.